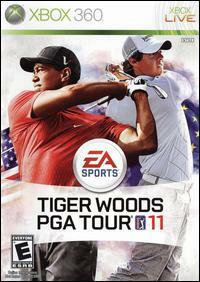 Tiger Woods PGA Tour 11 plays to both sides of the Atlantic, prominently featuring the Ryder Cup as its showcase tournament. Players choose a squad to take through competition in several team play formats, and can lead their golfer to the ultimate victory in the tournament's Singles rounds. Along with all-American Tiger Woods, PGA Tour 11 co-stars up-and-coming Irish sensation Rory McIlroy, with high hopes of leading the European teams to victory over their overseas rivals. Within and beyond the new cross-continent competition, PGA Tour 11 offers the myriad options and refined play style fans have come to know over a decade of top-selling golf games, along with new customization choices and enhanced graphics. In addition to Celtic Manor, home of the 2010 Ryder Cup, players have access to favorite courses from past games, including TPC Scottsdale. For the first time in the top-selling golf game series, players can compete as a team online, forming a virtual foursome and hitting the courses together in competition with other human-controlled teams. Special chat options allow teammates to stay in constant communication, to discuss strategy (or any other topics of interest) as if they were standing together out on the links.